The Buduburam United Methodist Church was established in Ghana when the LIberian refugee population began to increase. It came about on December 16, 1993 when a group of 12 United Methodists, along with Rev. Dr. John G. Innis, who was visiting the Refugee Camp at the time, started discussing the important role of the church during the Liberian crisis and expressed the need to establish a United Methodist Church in Ghana. This meeting was presided over by Rev. John G. Innis and Mother Rose E. Cummins. At the end of that meeting, it was concluded or agreed upon that all Christians from the United Methodist denomination, residing on camp Buduburam, come together to worship in their own traditional way. Finally, on Sunday, December 19, 1993, the first worship service was held in a class room of the Buduburam Refugee Community School. The sermon was delivered by Rev. John G. Innis, who was at the time serving as Administrative Assistant to Bishop Arthur F. Kulah. After that first worship service at the Buduburam Refugee Community School, the congregation moved to the UNHCR Women’s Training Center. To facilitate the worship service at that time, an arrangement was made with the officials of the St. Gregory Catholic Church to borrow their benches. With this arrangement in place, the members of The United Methodist Church waited until the worship service at the Catholic Church was over and collected the benches to be taken to the UNHCR Women’s Center for their worship service. This arrangement went on for a period of time until the church moved to a new edifice. Mother Rose E. Cummins, who was later given dispensation and appointed by Bishop Arthur F. Kulah in 1991, became the first pastor of the newly established United Methodist Church in Ghana. The rapid growth of the membership of the church gave birth to the idea of the construction of a new edifice. A committee on building was established by the Administrative Council, then headed by Bro. Jackson Duo, to supervise the construction, and the entire membership supported the cost which amounted to eight million, five hundred thousand (8,500,000) Ghanaian cedis. Taken with slight modifications from The History of the United Methodist Church in Ghana. 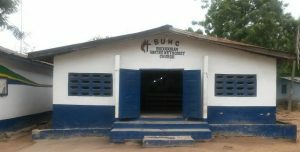 (Buduburam, Ghana: The Committee on Communications and Church History, Buduburam United Methodist Church: 2006).